Received: November 19, 2018; Published online: March 31, 2019. Interleukin-32 (IL-32) was originally identified in natural killer (NK) cells activated by IL-2 in 1992. Thus, it was named NK cell transcript 4 (NK4) because of its unknown function at that time. The function of IL-32 has been elucidated over the last decade. IL-32 is primarily considered to be a booster of inflammatory reactions because it is induced by proinflammatory cytokines and stimulates the production of those cytokines and vice versa. 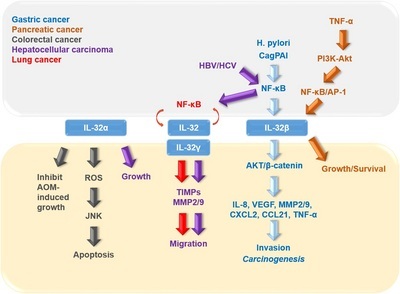 Therefore, many studies have been devoted to studying the roles of IL-32 in inflammationassociated cancers, including gastric, colon cancer, and hepatocellular carcinoma. At the same time, roles of IL-32 have also been discovered in other cancers. Collectively, IL-32 fosters the tumor progression by nuclear factor-κB (NF-κB)-mediated cytokines and metalloproteinase production, as well as stimulation of differentiation into immunosuppressive cell types in some cancer types. However, it is also able to induce tumor cell apoptosis and enhance NK and cytotoxic T cell sensitivity in other cancer types. In this review, we will address the function of each IL-32 isoform in different cancer types studied to date, and suggest further strategies to comprehensively elucidate the roles of IL-32 in a contextdependent manner.